As expected, Apple has launched iOS 7.1 download update for public iOS users. The iOS 7.1 download was expected to launch somewhere in the start of March, and now finally we have an updated firmware version for iOS 7.x.x running devices. The latest iOS 7.1 firmware brings number of new features, and lots of improvements and bug fixes for the latest and older iPhone devices. As stated by Apple, the iOS 7.1 firmware update is essential for iPhone 4 users. 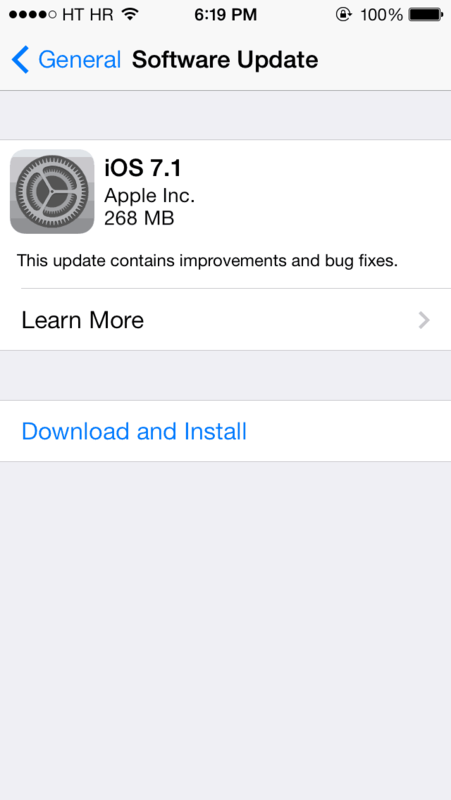 As iOS 7.1 download carries major user-interface fixes for them. The iOS 7.1 update is the very first major update of iOS 7 since the launch of iOS 7 in September 2013. The iOS 7.1 download is not recommended for jailbroken users, as it fixes evasi0n7 jailbreak exploit on latest and older iOS devices. If you are a fan of Jailbreaking than simply avoid updating your device to iOS 7.1.
iOS 7.1 download carries a build number of 11D169b. The iOS 7.1 download is available via download links, and over the OTA update to all of your devices. Apple released iOS 7.1 with one of the very important iOS 7 feature of CarPlay. We have already seen major automobile companies showcasing their new support with Apple iOS 7.1 running devices, and now this is time for general public to update their devices for full support in cars. To install iOS 7.1 download on your iPhone, you need to go to Settings, and then Software Update panel to install the latest firmware update. We are also uploading latest firmware download links on our servers, so you guys will able to download iOS 7.1 as a complete update. The iOS 7.1 download links are coming soon, in the meantime you can update your device using an OTA update.